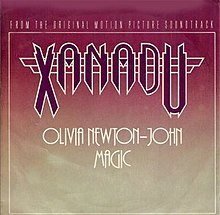 "Magic" is a 1980 song performed by Olivia Newton-John, from the soundtrack to the film Xanadu. The song was number 1 on the US Billboard Hot 100 for four weeks beginning on August 2, 1980. On August 30, it was displaced from the top by "Sailing" by Christopher Cross. It was Newton-John's 25th American chart hit, and her 10th of 12 records which went Gold or higher. "Magic" was also Newton-John's biggest pop hit until "Physical" ruled the Hot 100 for ten weeks beginning in November 1981. Billboard magazine ranked "Magic" as the third most popular single of 1980, behind only "Call Me" by Blondie and "Another Brick in the Wall, Part II" by Pink Floyd. In Canada, the song spent two weeks at number one. It also reached number 4 in Australia and number 32 in the UK. The song became Newton-John's biggest Adult Contemporary hit to date, spending five weeks at the top of the American chart, and also topped the Canadian AC chart for a week. John Lennon named "Magic" and "All Over the World" as two recent songs he liked in a Newsweek interview in September 1980, shortly before his death. The B-sides vary, depending on the label: "Fool Country" (also from Xanadu but not on the OST) is the B-side of the MCA release; "Whenever You're Away from Me" (with Gene Kelly) is the B-side of the Jet release. 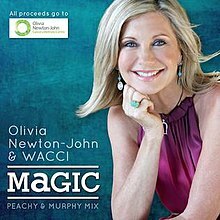 "Magic (Peach & DJ Dan Murphy remix)"
(2010) "Magic (Peach & DJ Dan Murphy remix)"
"Magic (Peach & DJ Dan Murphy remix)" is a remix of the 1980 song. In May 2011, the song was remixed by two Australians, DJ Dan Murphy and Steve Peach, to create a dance version. Olivia went back to the studio to re-sing the vocals. The version was sponsored by WACCI, a humanitarian group. Everybody who worked on the project volunteered their time, with all proceeds being donated to Olivia's charity, the Olivia Newton-John Cancer and Wellness Centre. Olivia was presented the world premiere of the song on Australian Dancing with the Stars on Sunday May 22, 2011. The song was released exclusively on Australian iTunes, also on Sunday May 22. A video was shot for the new remix in Sydney in an attempt to break the Guinness Book World Record for largest cast in a music video by featuring 350 people. Newton-John does not appear in the video, which was directed by DJ Dan Murphy. The song is included in the film Xanadu and also the Xanadu musical. A version of the song by Stimulator was used in commercials for Macy's. This cover was also used in the film Ella Enchanted and appeared on the film's soundtrack. Another updated version of the song was performed by Meaghan Martin for the Disney Channel Original Movie Wizards of Waverly Place: The Movie. It was subsequently included on the television series and the film's soundtrack album. In 2015, the singer/pianist character performed the song in Part I of the HBO mini-series Olive Kitteridge. In 2015 Newton-John teamed with her daughter Chloe Lattanzi and Dave Aude to rework the song's chorus into a new recording, "You Have to Believe". The song went to number one on the US Dance Club Songs chart. Juliana Hatfield covered the song on her album Juliana Hatfield Sings Olivia Newton-John. ^ Sendejas Jr., Jesse (August 7, 2014). "The '70s' Seven Sexiest Soft-Rock Songs". Houston Press. ^ "Item Display - RPM - Library and Archives Canada". Collectionscanada.gc.ca. Retrieved October 16, 2016. ^ "Did John Lennon love the soundtrack to Xanadu ? | Steve Hoffman Music Forums". Forums.stevehoffman.tv. September 1, 2013. Retrieved October 16, 2016. ^ a b Steffen Hung. "Forum - Top 100 End of Year AMR Charts - 1980s (ARIA Charts: Special Occasion Charts)". Australian-charts.com. Archived from the original on October 6, 2014. Retrieved 2016-10-16. ^ "SA Charts 1965–March 1989". Retrieved September 5, 2018. ^ Whitburn, Joel (2002). Top Adult Contemporary: 1961-2001. Record Research. p. 182. ^ "Top Selling Singles of 1980 | The Official New Zealand Music Chart". Nztop40.co.nz. December 31, 1980. Retrieved October 16, 2016. ^ "Hot Dance Club Songs". Billboard. Nielsen Business Media, Inc. November 21, 2015. Retrieved November 10, 2015. ^ Erlewine, Stephen Thomas. "Juliana Hatfield Sings Olivia Newton-John". AllMusic. Retrieved April 23, 2018. This page was last edited on 11 April 2019, at 10:01 (UTC).